An economical way to quickly and effectively fill a large border with a dazzling display of glistening colour. Tall, wide, sturdy plants bear large, showy blooms in shades of rose, pink and white throughout the summer. The large bushy plants produce giant trumpet-like flowers. Flowers July-September. Height 60-70cm (24-27"); spread 40-50cm (16-20"). 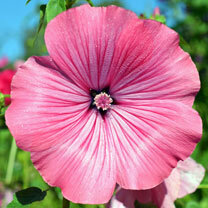 Sow direct into finely raked, moist, warm soil where they are to flower at a depth of 6mm. Thin out seedlings to a final spacing of 45cm. Choose a sunny position. Ideal for beds and borders. Attractive to butterflies and bees. Prefers full sun.